I think I mentioned a couple of days ago that I might need a couple of drinks to get me through the end of summer and my baby starting kindergarten. Well, despite today's post on margaritas, I would like to assert here and now that I am not drinking my miseries away. It just so happens that I had a couple of chances to make and enjoy some great fruity drinks. 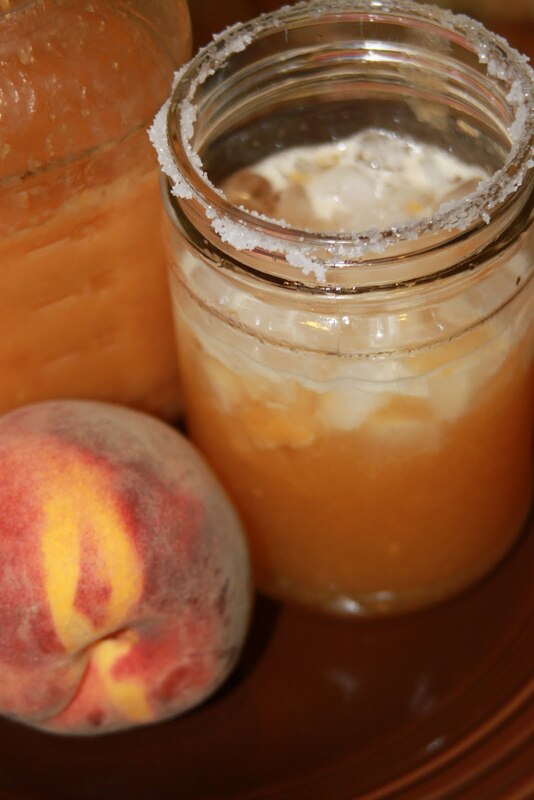 When life gives you peaches, make peach pie margaritas. Let's assume for a minute here that you don't need all that butter and processed flour and sugar that is in a pie crust. We'll just skip over the crust, stir in some tequila, and consider it dieting. We thought we would take advantage of the fact that the summer fruit trees are exploding and the prices are low on ripe fruit, and we bought an extra 20 pounds of peaches from Abundant Harvest. After canning most of them (to enjoy during the long winter months of citrus), and freezing some (for my morning smoothie), I still had a few left over. Peach margaritas are delicious. They beat the pants off of any sort of neon green stuff you mix with tequila. I am not one to ever turn down a real margarita mixed with Cointreau or Grand Marnier, but this adds a little summery twist that makes the margarita an amazing treat. This drink is basically just a standard margarita with some peach syrup mixed in. I got the recipe from How Sweet It Is, and I am heading back over there to try lots more of her stuff. Although she swears off vegetables, I think she has plenty to offer me. Like margaritas. Make some simple syrup (boil equal parts water and sugar until the sugar is dissolved). 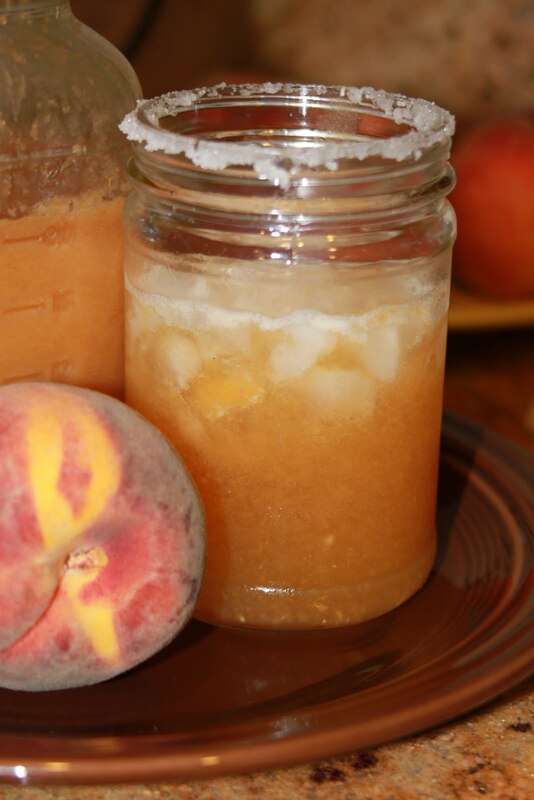 Combine one cup of simple syrup with three peaches (that you peeled and chopped) in your blender. Puree until it is smooth. You can use this syrup in the many of the same ways as the plum syrup of earlier this week. (pour it one cupcakes, shake it with vodka, make a spritzer with club soda, and on and on). But first, promise me you'll do this: Make the margarita. You won't regret it, and you'll have some peach syrup left over for less lofty goals. Salt the rim of a glass and fill it with crushed ice. In a cocktail shaker, combine the peach syrup with 2 ounces Triple Sec or Grand Marnier, 1 1/2 ounces of tequila, 2 ounces lime juice (either fresh squeezed, or Rose's Sweetened Lime Juice in a pinch). The amount of peach syrup is up to you. I used about 1 1/2 ounce, since I didn't want the drink to be too sweet and sugary. I like a little bite to it. Also, if you use Rose's lime juice, it will make the drink a little sweeter than fresh lime juice, so you may want to scale back the peach syrup. Hey, it just means you can make more drinks in the long run! Shake it all up and pour it over your ice. Sit back, put your feet up, and say "aaaah."